Assist Law Ltd have been fined £30,000 for making calls to consumers registered on the Telephone Preference Service (TPS) despite assurances from its suppliers that the data was opted in. Between April 2015 and April 2016, the TPS received a total of 99 complaints, 84 directly to the TPS and 15 to the Information Commissioners Office (ICO). Over a 13 month period that amounted to just over 7 complaints a month. On the face of it that may not seem like a lot, however, it was enough to prompt the ICO to launch an investigation. Assist Law Ltd were providing Will Writing services and using data purchased from a third party supplier as opted in so Assist Law thought they had the appropriate permissions to make the calls. This was not the case. It’s against the law for companies making marketing calls to telephone people registered on the TPS without the proper consent, which is a greatly misunderstood aspect of the data buying and selling industry at present. Companies should carry out their own checks to make sure they are not calling people on the TPS register and not rely on the reassurances of third party suppliers. The ICO are taking a hard stand against the lax nature of companies purchasing so called opted in data. Nouveau Finance Ltd fined £70,000 – a supplier assured them data was opted in. Ocean Finance fined £130,000 – a supplied assured them data was opted in. Vincent Bond & Co fined £40,000 – they used a supplier to provide them leads. “Despite repeated warnings, this company failed to take the basic steps required by law. They should have asked for evidence of consent and screened against the TPS list to check whether people had chosen not to receive marketing calls. “The average company has a business of whatever it does, in this case writing wills. They were not experts in marketing and this is where Assist Law and many others like them past, present and future are and will keep getting caught out by accepting the assertions of third party suppliers about the nature of their data being opted in. The Government has recently announced plans to introduce fines of up to £500,000 for company directors heading up nuisance marketing firms. The new law is expected to come into force next spring. 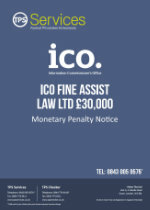 For more information see our article Directors soon to held personally liable by ICO.